My family has always loved audiobooks in pretty much any form: plain-old reading, dramatized reading, radio theater, and most recently, the immersion-style experience we get with the Kindle. My family has also always loved missionary stories, as we started reading those on a regular basis over 14 years ago. When you can get both at once? Bonus! We absolutely loved the first season (Episodes 1-12) of The Brinkman Adventures, so we were thrilled to receive Season Two: Episodes 13-24 recently. You can read my review of Season One at The Old Schoolhouse. In that review, I started off with, "This Brinkman family loves The Brinkman Adventures, and not just because we like their last name!" That's even more true after listening to Season Two. These stories are great for the entire family, but if your children are younger, you might want to listen to some of them first. One episode, Hadi's Choice, starts off with Jack Brinkman telling you that parts of this particular episode may be intense, so if you are under ten, you want to be sure you have a parent listening with you. So, after all that, just what is The Brinkman Adventures? Basically, this is a radio drama, featuring a large family (based on a real family), that focuses on modern missions. The Brinkman family does some short term missionary work themselves, and they get themselves into situations where other people are telling them stories about their missionary adventures. Along the way, you have all kinds of crazy antics inherent in a big family. The overall story arc of Season Two is that the Brinkman family is driving a bus down to a mission school in Belize. Along the way, they meet a couple who served as missionaries in Hong Kong, and they have a fair number of scrapes along the way. You learn about the missionary work in Belize once they get there. There are stories featuring issues such as modern slavery, and the work of some Christian organizations to free these slaves. In some of the stories, names and locations are changed in order to protect the people doing the work. One story takes place in Bazakistan, for instance. Go ahead, try to find that country on your map! Clearly, this is meant to be one of the former USSR countries, but we don't know which, and we certainly don't need to know either. 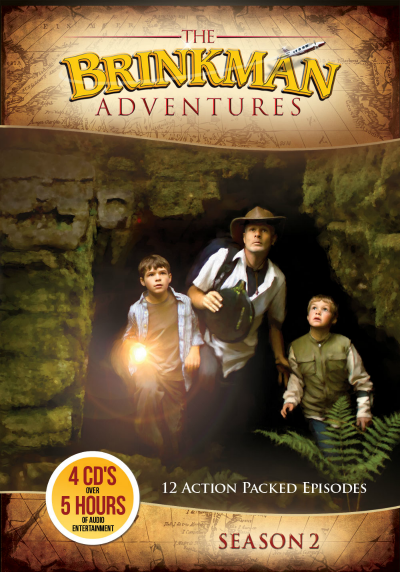 I highly recommend The Brinkman Adventures. Available for a suggested donation of $25 for the CDs or $17 for the download version, these are exciting, fast-paced dramas that you can listen to over and over again. One of the greatest things about these dramas is that they are based on real events that happened to real missionaries. You can go to the "Real Stories" page to find out more (but don't do that until you've listened to the episode! Spoilers!!) We usually can't go read the 'what really happened' part right after we listen, but we love going in and reading it once we are back home. Recently, Trina (my 8 year old) needed to give a basic report about a present-day missionary. She turned to The Brinkman Adventures for help with that. We re-read the real information about one of the episodes (from Season One), and then Trina went and did a bit more research on that. Of course, we have a new family saying based on one of the first episodes this season. "Brinkman family! How big is your God?"